Just Press Play is a collaboration with Rochester Institute of Technology (RIT) to wrap gameful and ludic experiences around the traditional pedagogical processes of a modern university. Starting in October of 2011, 750 students at RIT’s school of Interactive Games and Media received some cryptic instructions to log onto a website, create a profile, talk to a professor, and pick up a keychain. 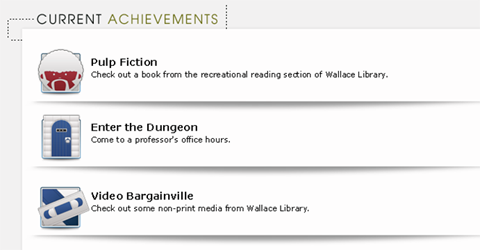 These four tasks comprise the “Initiate Quests” of the Just Press Play alternate reality game (ARG). An ARG is an interactive narrative that uses the real world as a platform, often involving multiple media and game elements, to tell a story. The story of Just Press Play begins more than 100 years ago, when two local Rochester schools, the Athenaeum and the Mechanics Institute, merged to form the institution that would eventually become RIT. According to the ARG story, those two institutions have never truly merged and the student must complete quests that will reveal the secret history of RIT and draw them into an ancient conflict between individual and group, art and technology. 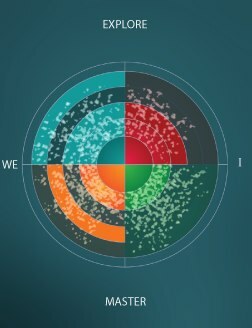 Each of the initiate quests is a first step along four complimentary paths (illustrated in image to right) that encourage pro-academic and pro-social behaviors. The quests are arranged along a two-dimensional axis according to how they align to these paths. Each quest is a combination of “Explore/Master” and “I/We.” For example, a challenge to write a creative blog post would be an “Explore/I” quest (individual creativity). A challenge to work together with a team of developers to create a 3-D game engine would be a “Master/We” quest (collaborative technical mastery). As the players complete quests, they are awarded achievements. 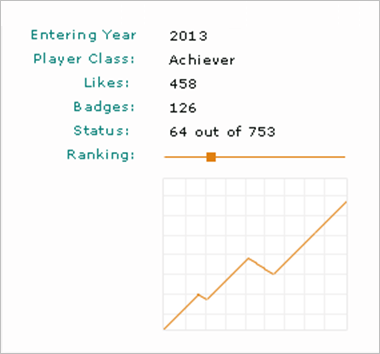 These achievements show up on a player profile and a map that displays how the achievements are spread out on the graph. Over time, most students will begin to focus on a particular quadrant of the graph and this will cause them to align to a particular character class—an identity that will describe to some extent their strengths (and weaknesses). Higher-level challenges will require the creation of teams that are composed of different classes. For example, a student may be asked to gather four solo artists and have each of them create a unique work (collective creativity) or challenge another programmer to a coding duel (individual mastery). There are also boss battles that serve as gateways to higher levels. Some of these boss battles are collective, such as a flash mob where students dressed as zombies and acted out Michael Jackson’s “Thriller” video. Some are academic, such as an achievement that freshmen receive only if 90 percent of their classmates pass mid-term exams. Some of these are individual challenges, such as exploring dozens of locations around campus. Physical exploration and real-world activities are a big part of the game. The keychain that students receive during their initiate quest is actually a passive radio-frequency identification (RFID) device. When the keychain is passed over a special sensor (this is called “swiping”), a code is sent to a central server that records a unique pairing between the student and a location. This makes it easy for the game to keep track of where students go, when they go, and with whom they go. This information is not used for any type of surveillance, but rather to fuel the mechanics and dynamics of the game. Additional information comes directly from RIT’s student information systems (SIS). All major universities keep track of a vast quantity of student data. This is far more than their grades and comprises just about every aspect of their lives, including which books they check out at the library and what food they eat at the cafeteria. This data is integrated with the RFID information—and additional information provided by the students—to power the core game experiences. Just Press Play is designed to be a fun and engaging game, and engagement is a key factor in promoting academic success. At a more fundamental level, however, Just Press Play is about data. The majority of data about students, educators, and institutions is locked away in siloes and is not used to its full effect. Often the data is available only to administrators who use it simply to generate high-level reports. Just Press Play hopes to bring all of this data to one place and liberate it—make it available to not just administrators, but to educators and students as well. Insights gleaned from this data can be used to design mitigations that might help improve the experiences of students and make them more successful at their studies. Traditional mitigations are developed in experimental conditions that often bear no relationship to real-world environments and apply to the lowest common denominator. 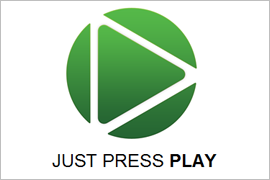 Just Press Play aims to deliver formative feedback directly to the student in a form that is relevant not as a blanket statement but tailored to their region, sub-region, county, school, classroom and, ultimately, to the individual student. For example, a researcher might someday sift through Just Press Play data and discover that 90 percent of students in Macon County, Georgia, who take swim classes graduate from high school. This might not be a direct correlation, but the principal can test the hypothesis by creating a swimming challenge and rewarding students who swim. Students can create their own challenges to pass along lessons that they learned during their time at the school. Students might one day even make challenges for educators and even institutions. The immediate goal of Just Press Play is to explore the design, legal, and privacy challenges related to creating an ARG for education. The ultimate goal is to create a unified game layer for education: the plumbing through which educational data can flow between institutions and follow the student from pre-kindergarten through high school and college—providing them with insights and motivation as they embark on an epic quest of lifelong learning.